Linteau, Paul-André. "Montreal". The Canadian Encyclopedia, 09 October 2018, Historica Canada. https://www.thecanadianencyclopedia.ca/en/article/montreal. Accessed 18 April 2019. Montreal, Quebec, incorporated as a city in 1832, population 1,704,694 (2016 c), 1,649,519 (2011 c). Montreal is Canada’s second largest city and is home to nearly half of the province of Quebec’s population. It is the metropolis of the province and was the most populous city in Canada for a century and a half. It is located in southwestern Quebec on Île de Montreal at the confluence of the St. Lawrence and Ottawa rivers. Montreal is a major industrial centre, commercial and financial metropolis, railway and maritime bridgehead, and one of the centres of francophone culture in North America. It is one of the world's great cities and enjoys international acclaim. 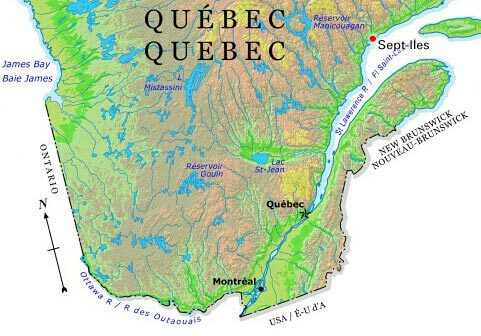 The present-day island of Montreal and the surrounding areas were long inhabited by the St. Lawrence Iroquoians . The island was a good site for settlement due to the natural resources nearby, and the St. Lawrence River and Lachine Rapids made it necessary for travellers to stop there and unload their boats. In 1535 French navigator Jacques Cartier visited one of their villages, Hochelaga, a large village made up of approximately 50 longhouses and a population of approximately 1,500 people located on the slopes of Mont Royal, a small mountain of volcanic origin. The residents of Hochelaga were primarily agriculturalists, but also ate fish and game. For reasons that remain unclear, but may include European diseases and wars with other groups, the St. Lawrence Iroquoians disappeared as a distinct nation by the late 16th century. Montreal (sometimes also called Ville-Marie) was founded in 1642 as a missionary colony under the direction of Paul de Chomedey de Maisonneuve and Jeanne Mance , but the fur trade soon became its main activity. Maisonneuve and his group of four dozen colonists were caught in a storm of conflict between Indigenous peoples for control of the fur supply. A permanent state of war with the Iroquois marked the early decades of the colony's existence (see also Iroquois Wars). In 1665, Louis XIV sent 1,200 French troops to the colony, and these troops attacked the Iroquois the following year. Permanent peace was only established in 1701 with the conclusion of a major treaty, La Grande Paix, between the French, the Iroquois and more than 30 other Indigenous groups. Montreal was a city of the interior, in contrast to Quebec City, which was the administrative capital and the main port where exchanges with France took place. Montreal soon became the great centre of the fur trade. Coureurs de bois, voyageurs	and such famous explorers as René-Robert Cavelier de La Salle, Daniel Dulhut, Pierre Le Moyne d'Iberville and Pierre Gaultier de La Vérendrye	all set out from the city. These traders and explorers methodically explored the North American continent from the Gulf of Mexico to the Rockies and established a network of trading posts to secure furs for the Montreal fur trade. The fur trade relied on the labour of Indigenous peoples and did not provide much employment in Montreal itself. Strong dependence on this single industry and the region’s weak agricultural output resulted in slow population growth early on. At the end of the 17th century, for example, the city had just over 1,000 inhabitants. Almost one century later, in 1789, the population had only reached approximately 5,500. In 2017, the city added a white pine to its coat of arms and flag to recognize the contributions of Indigenous people over its history. The initiative was tied to celebrations marking the 10th anniversary of the United Nations Declaration on the Rights of Indigenous Peoples. In 2017, Montréal added a white pine to its coat of arms and flag to recognize the contributions of Indigenous people over its history. The initiative was tied to celebrations marking the 10th anniversary of the United Nations Declaration on the Rights of Indigenous Peoples. Religious institutions made their presence felt in the life of the community. Among these was the Order of Saint-Sulpice, which owned the seigneurie of Île de Montreal for close to 200 years and provided priests for the parish church. Built in 1685, the Order’s seminary building still stands on the Place d'Armes. 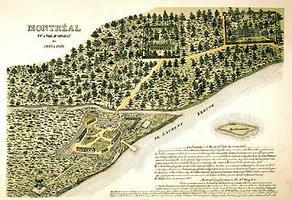 Montreal surrendered to British forces in 1760 during the Seven Years’ War. For several decades after the British conquest Montreal's economy continued to depend mainly on the fur trade. Scottish merchants such as Alexander Mackenzie, the Frobisher brothers (Joseph, Benjamin and Thomas), Simon McTavish, and Duncan, Simon and William McGillivray	took the place of francophone merchants. The Scots combined their business interests and created the North West Company to compete more effectively with the Hudson’s Bay Company	for control of the fur trade of the Northwest. Despite the disadvantage of distance the Montreal-based North West Company prospered until it was assimilated by the Hudson’s Bay Company in 1821. The fur trade played an important role in establishing Montreal's influence over the interior, but from the end of the 18th century the city's growth depended increasingly on the settlement of the rural hinterland, including the plain outside Montreal and areas in Upper Canada. The large influx of immigrants from the British Isles, which began in 1815, accelerated the settlement process. By the 1820s Montreal’s population was larger than Quebec City’s, and it had clearly asserted itself as the metropolis. In 1825 Montreal already had 22,540 inhabitants, and by 1844 the number had grown to 44,591. A dynamic merchant class involved in the import and export trade replaced the fur-trade magnates. This group created the Bank of Montreal in 1817 and the Committee of Trade in 1822. They also invested in maritime shipping and began to invest in railways in 1836. Residents of British origin became the majority in the city around 1831 due to large-scale immigration. Conflict between French and English residents and struggles for representative government marked the 1830s, and resulted in the Rebellions of 1837. The defeat of the Patriotes	in the rebellion gave the new anglophone middle class a political victory, and after 1840 francophone leaders had no choice but to co-operate with them. From 1844 to 1849, Montreal was the capital of The United Province of Canada. On 25 April 1849, however, English rioters set fire to the parliament building (see Montreal Riots). They were angry over legislation that the British government compensate the French for damage done during the Rebellions of 1837 (see Rebellion Losses Bill). The capital subsequently alternated between Toronto and Quebec City until 31 December 1857, when Queen Victoria chose Ottawa. Fundamental changes took place in Montreal’s transportation and industry in the following years. Expansion of the St. Lawrence canal system and the deepening of the channel to Quebec City made Montreal the area’s principal seaport, while railway construction, particularly of the Grand Trunk Railway, made the city the hub of the railway system. The process of industrialization begun around the middle of the 19th century began to alter the city's face completely. After depending for generations on trade and commerce for its livelihood, Montreal was becoming a major industrial centre. Snowstorm on St Catherine Street (courtesy Notman Photographic Archives/McCord Museum). Montreal grew rapidly from 1850 to 1914. The population increased from 44,591 in 1844 to 467,986 in 1911, 528,397 including the suburbs. The city proper overflowed its boundaries and quickly reached suburban communities, annexing 23 between 1883 and 1918. French Canadians in search of work poured into the city from rural areas, and in 1865 francophones again made up the majority of the city’s population. Immigration increased dramatically at the turn of the century, and Montreal became a more ethnically and culturally diverse city. The settlement of the Canadian West was also important for Montreal’s development, as in the 1880s the Canadian Pacific Railway established its head office in the city. This meant that much western grain was shipped overseas through the port of Montreal, which was considerably enlarged at the beginning of the 20th century. In this period Montreal was indisputably the metropolis of Canada, and St-Jacques (St. James) Street was the country's financial centre. However, Toronto was a powerful rival, and benefited more in the long run from western settlement and from the growing trade with the United States. By 1960 Toronto had taken over Montreal's place as Canada's centre of economic activity, in part because of American industrial capital invested in Ontario. Montreal experienced another period of growth after the First World War that was based on industry, trade, finance and transportation. In 1931 the population of the city and suburbs reached over one million, but the Great Depression brought this period of expansion to a halt and caused great hardship among the population. At the Depression's height in February 1934 there were 62,000 unemployed people in the city, and 240,000 receiving government assistance. The city administration went into debt because of huge relief expenses and in the early 1940s was placed under trusteeship by the provincial government. The Second World War stimulated production and employment and helped restore prosperity to the city. The 1950s and 1960s saw strong growth, especially in the suburbs where many new cities sprang up, as well as in the downtown area. Montreal embarked upon great projects under the leadership of Mayor Jean Drapeau, several on an international scale. The Métro subway system began in 1966, the International World Exposition took place in 1967 (see Expo 67), and the 1976 Summer Olympic Games and the 1980 Floralies Internationales horticultural fair were hosted by the city. The Métro and Expo 67 were undertaken during a period of relative prosperity, but in the 1970s the city was in economic decline. After a long and painful period of industrial reorganization marked by high unemployment Montreal regained a strong vitality in the mid-1990s, and entered the 21st century with a modernized and buoyant economy. The Jacques Cartier Bridge crosses from Ile Ste-Hélène (foreground) to Montréal (photo by Michel Gangné/courtesy SSC Photocentre). Place des Arts is the centre for the performing arts in Montréal, with 3 concert halls (courtesy Canadian Tourism Commission). Montréal (courtesy Canadian Tourism Commission). Much of Montréal's success as the metropolis of Canada was owing to its status as a port (courtesy Canadian Tourism Commission). The city of Montreal encompasses the whole island of Montreal and some smaller surrounding islands. There are many riverside parks all around the island and along the Lachine Canal. Mont Royal dominates Montreal's landscape, and determined its settlement pattern for many years. After a trial period at Pointe-à-Callière, a point of land at the confluence of the St. Lawrence River and a smaller river, Montreal's founder, Paul de Chomedey de Maisonneuve, moved to an elevated site (25 m) farther from the river near Place d'Armes. This would become the site of Vieux ("Old ") Montreal, enclosed between 1718 and 1744 by a wall which was demolished in the early 19th century. Few visible traces of the early French settlement remain. Some exceptions include the Order of Saint-Sulpice Seminary built in 1685, and the residence of Governor of Montreal Claude de Ramezay, Château Ramezay, built in 1705. Most of the old buildings still in existence date from the 19th century, as the area's wealthy residents have made way for stores, warehouses and office buildings. For a long time downtown Montreal was confined to the area around Notre-Dame and St-Jacques streets. Since 1960, however, a new downtown area has grown up along René-Lévesque Boulevard (before 1987 known as Dorchester Boulevard). This street is lined with skyscrapers, the most famous being the cruciform Place Ville Marie	(45 storeys), which was inaugurated in 1962. This downtown expansion led to the remodelling of the city. Many buildings with historical value were demolished, ancient residential areas were radically altered, and thousands of low-income residents were displaced. Around this downtown core are residential districts dating from the beginning of the 20th century that have the highest density of dwellings in the city. These houses generally have two or three storeys and were built in rows. Many also have much-celebrated outdoor stairways, a trademark of Montreal architecture of this period. The well-to-do areas nestle on the higher slopes of Mont Royal, especially the boroughs of Westmount	and Outremont with their numerous parks, impressive mansions, and elegant public buildings. At the mountain's main summit are Mount Royal Park and two cemeteries: Mount Royal Cemetery and Cimitière Notre-Dame-des-Neiges. To the north the imposing shape of the Olympic Stadium (1976) dominates the district of Maisonneuve. The newer districts built just after the war, such as Ahuntsic on the Rivière des Prairies, are further away from the downtown and have a lower dwelling density than the older sectors. The vast suburban areas, developed from the late 1950s, feature North American-style single-family residences. They cover the western and eastern ends of the island of Montreal and overflow onto Île Jésus (Laval), the North Shore and the South Shore (Longueuil). The Montreal landscape is circumscribed by the majestic St. Lawrence to the south and the Rivière des Prairies, to the north. Numerous bridges for automobiles and railways connect the different areas. In recent years the safety of many of these bridges has been questioned, and plans are underway for the construction of a new Champlain Bridge, scheduled to open in 2021. Two islands in the St. Lawrence River face the port of Montreal. Île Ste-Hélène was a park for many years and was enlarged for Expo 67; the La Ronde amusement park is also located there. Next to it is the artificial Île Notre-Dame. Built for Expo 67, the island also housed Floralies Internationales in 1980. It is now a recreation playground and contains Casino de Montreal. Montreal has had three distinct decades of rapid growth since the mid-19th century: 1851–61, 1901–11 and 1951–61. Demographic growth has largely been the result of an influx of people from outside the city, as the periods of rapid growth coincided with the arrival of large numbers of immigrants. The most significant growth, however, was a result of internal migration, as a significant number of French Canadians and smaller numbers of English-speaking Canadians living in Quebec rural areas moved to the city. Natural growth was also a major contributing factor after the Second World War. Between 1966 and 1981 the number of city residents declined, then rose slightly to stabilize at just over 1 million. During that period most of the population increase occurred in the suburban cities. In 1996, 31 per cent of the metropolitan area population lived in Montreal proper, down from 80 per cent in 1931. The 2002 amalgamation of the island of Montreal altered that trend as the city population rose to 1.8 million and to 53 per cent of the metropolitan total. For most of the 19th century, the vast majority of Montreal’s population was of French or British descent. The British were in the majority between 1831 and 1865, after which time French Canadians again became the most populous ethnic group. At the turn of the 20th century Jews from Eastern Europe began to arrive, starting the process of ethnic diversification that accelerated during the 20th century. According to the 2016 census, people citing Canadian ethnic origins make up the largest ethnic group, at 29.4 per cent of the city’s population, followed by French (20.1 per cent) and Italian (8.8 per cent). Visible minorities account for 34.2 per cent of city residents, with Black, Arab and Latin American people comprising the largest communities within this group. Those for whom French is their mother tongue make up the majority of the city’s population, at 53.4 per cent. Native English speakers account for 15.1 per cent of city residents, while those with a mother tongue other than English or French account for 36.8 per cent. After having an economy based on the fur trade for 150 years, Montreal evolved into a diversified commercial metropolis, focusing on both international trade and the distribution of manufactured goods. Industry played a growing role from the mid-19th century, and in the 20th century the services sector expanded with the rise of financial institutions, universities and engineering firms. In the late 1960s Montreal experienced much slower growth than in previous decades. Toronto’s rise as the unchallenged metropolis of Canada led to hundreds of corporate head offices relocating there. This process gained momentum during the 1960s and 1970s and was fuelled in part by many anglophones’ fears of the changing political and linguistic environment. This loss was only partly offset by the tremendous rise of major corporations owned or developed by francophone entrepreneurs (such as Bombardier or Quebecor) or by the provincial government (Hydro-Quebec and Caisse de Dépôt et Placement). At the same time, Montreal’s economy was also deeply shaken by a major industrial reshuffling that affected most of the manufacturing centres of North America and Europe. The city’s old manufacturers of consumer products geared to the domestic market were no match for growing international competition. They closed their doors in droves, and the remaining manufacturers turned to highly automated production for niche markets to survive. The depressions of the early 1980s and 1990s also hit the city particularly hard, and unemployment rose dramatically. Despite social and economic hardship, the whole metropolitan area emerged from this fundamental reshuffling with a modernized and competitive industrial structure. The city experienced a burst of activity during the second half of the 1980s and saw sustained growth from the mid-1990s. Montreal remains the second-largest metropolis in the country and hosts the headquarters of a number of Canada’s major corporations. It is also a leading research and development centre, with its four universities and numerous research institutes and laboratories in areas such as telecommunications, pulp and paper, aerospace, software and pharmaceuticals. The largest share of Canada’s aerospace production is carried out in metropolitan Montreal by Bombardier, Canadair, Pratt & Whitney Canada, Bell Helicopter, CAE and numerous smaller firms. Other important manufacturing sectors include food, beverages, tobacco products, chemicals, fabricated metal products and clothing. Montreal’s expertise in transportation and aerospace has attracted international organizations such as the International Civil Aviation Organization (see United Nations). The city also boasts the world headquarters of the International Air Transport Association, which regulates air travel, and the North American head office of the International Society for Aeronautical Telecommunications. With its stock exchange and the corporate headquarters of banks and other financial institutions, Montreal remains a significant financial centre, despite Toronto’s dominant position. Although not a capital city, it has numerous federal and provincial government offices. Montreal has long been a key seaport in eastern North America. The constant improvement of navigation above and below the city began with the construction of the Lachine Canal in 1825 and continued with the deepening of the channel between Montreal and Quebec City in 1851. Before the opening of the St. Lawrence Seaway in 1959 all goods destined for or coming from the Great Lakes had to be transshipped at Montreal. in 2011 its container traffic made up 28 per cent of the international container traffic in Canada, making it second only to Vancouver. Port facilities now extend over 26 kilometres on the island of Montreal and handle close to 30 million tonnes of cargo and 2,200 ships per year. Long a major Canadian grain-exporting centre, Montreal's harbour has become one of the leading container-handling ports on the Eastern seaboard of North America. In 1978, the outdated facilities in its core area were transferred to the Old Port Corporation, an organization created to develop tourism and recreation. The area has been transformed into a popular downtown recreational area called Le Vieux-Port. Montreal was long the hub of the great Canadian National and Canadian Pacific Rail	transcontinental systems, and is closely associated with the history of Canadian railways. However, its prominence faded with the decline of rail transportation in eastern Canada. After 1970 Montreal also lost ground in air transport when a second international airport opened at Mirabel 57 kilometres northwest of the city, making local connections more difficult. However, Dorval regained its role as a hub airport in 1997 when all scheduled international and domestic flights were directed there. In 2004 Dorval airport was renamed Montreal-Trudeau airport in honour of the former Prime Minister (see Pierre Elliott Trudeau). A modernization of the airport was completed in 2006, and it now handles all passenger flights. Mirabel now handles all cargo flights, test flights, and general aviation operations. Air Canada, the country's leading carrier, also has its headquarters in Montreal. Interconnecting expressways, built mostly in the 1960s, crisscross the city and connect with numerous intercity highways. However, some of these projects were poorly built and are now in need of substantial repairs. The public bus and subway systems are under the jurisdiction of the Société de transport de Montreal. The Montreal Métro glides quietly underground on rubber tires and handles more than 1.2 million trips per day. In 2007 the city began to look for ways to reduce dependence on cars, which led to the introduction of the BIXI bike sharing system in 2009. Historically Montreal has been a leading communications centre in Canada and also plays a distinct role as the home of most French-language media in the country. The city houses the corporate headquarters, the head stations, and the main studios of four francophone television networks: the federally owned Radio-Canada (the French-language equivalent of the CBC), the provincially owned educational Télé-Quebec, and the privately owned TVA and V, formerly Quatre-saisons. The francophone radio networks are located in Montreal, including community radio station CIBL, Université de Montreal’s student radio station CISM, and CHOQ.FM, Université du Quebec a Montreal’s student radio station. This concentration stimulates the whole cultural scene, allowing Montreal to be one of the leading media centres for international French speakers. The anglophone population is also well served with two local television stations, CBC and CTV, and many local radio stations. Montreal has three French-language dailies: La Presse, Le Devoir and Le Journal de Montreal. The Montreal Gazette is the city’s English daily newspaper, and there are many other weeklies and specialized magazines. The major French-language book publishing houses such as Sogides, Quebec-Amérique and Boréal, are also located in the city. With the headquarters of Canada’s largest telecommunications company BCE Inc, Montreal is a major player in the field of telecommunications. Multimedia production is also very active, thanks to numerous and creative small- and medium-sized enterprises. Starting in 1796 Montreal’s municipal affairs were administered by magistrates not accountable to citizens for their actions. In 1832 Montreal got its first charter, which had a life-span of four years and allowed property owners to elect a city council. However, the city charter was not renewed in1836 because the provincial legislature was out of session due to political unrest in Lower Canada (Quebec). Because the charter was not renewed the magistrates resumed their administrative role until the city was granted a new charter in 1840. In 1851 the people were empowered to elect the mayor, although only property owners and certain tenants had this privilege. In its first decades the city council resembled a private club for important Montreal businessmen. In the late 19th century poor administration and corruption at city hall led some businessmen to form reformist groups. After a public inquiry, the provincial government created an elected four-member Board of Control, which limited councillors' responsibilities in the general administration. In 1918 financial difficulties led the Quebec government to set up a five-member administrative commission, with full powers to put the city back on its financial feet. The city council regained its powers in 1921, and in 1940 it was reformed: one-third of the 99 councillors were elected by property owners, another third by property owners and tenants, and one-third were appointed by public bodies such as the Chamber of Commerce and the universities. The last category was abolished in 1960, and universal suffrage in the election of the councillors and mayor was not introduced until 1970. Montreal’s city council is now made up of 65 elected officials, including the mayor, 18 borough mayors, and 46 city councillors. Montreal has had an executive committee made up of city councillors chosen by the mayor since 1921. The executive committee has 12 members including the mayor, and controls the legislative agenda, drawing up the budget and the by-laws and motions submitted to the city council. Montreal’s 20th-century politics were dominated by populist mayors who held office for several terms: Médéric Martin (1914­­­–24, 1926–28); Camillien Houde, nicknamed "Mr. Montreal " (1928–32, 1934–36, 1938–40, 1944–54); and Jean Drapeau (1954–57 and 1960–86). Drapeau's Parti civique de Montreal (founded in 1960) transformed civic political customs, which until then had been practised by somewhat lax interest groups and numerous independent councillors. The Parti civique held the majority of seats on council, lending cohesion and continuity to the city administration. During the 1970s, citizens' committees, trade-union militants and progressive associations combined forces in opposition. They created the Montreal Citizens Movement (MCM) and, under the leadership of Jean Doré, they won the elections in 1986 and 1990. MCM implemented administrative reforms and greater citizen participation in the decision-making process but was criticized for overspending. In 1994 the newly formed Vision Montreal swept to power under the leadership of Pierre Bourque with the promise of beautifying the city, cutting costs and simplifying the municipal bureaucracy, and was re-elected in 1998. Montreal and the suburban cities have long disputed the sharing of costs and responsibilities for urban development. Between 1970 and 2001 all municipalities on the island were represented in the Montreal Urban Community (MUC), a public body with island-wide responsibilities including police protection, urban planning, sewage treatment services and antipollution activities. Despite numerous proposals put forward by various inquiry commissions, municipal reorganization remained a divisive issue. In late 2000 the provincial government decided to merge the island's 28 municipalities into a single city. Many suburban municipalities and their citizens clamoured in protest, and even challenged the law up to the Supreme Court, but to no avail. Amalgamation took place on 1 January 2002. However, the new amalgamation law provided some measure of decentralization with the creation of 27 boroughs, each with its own elected council. These boroughs are responsible for local public works and neighbourhood services. At the regional level, in 2000 the provincial government also created the Communauté métropolitaine de Montreal as a coordination body between Montreal, Longueuil, Laval and the other outlying suburban municipalities. Its territory encompasses most of the metropolitan area. Shortly before the amalgamation in 2001 the Montreal Island Citizens Union (later the Union Montreal Party) under the leadership of Gérald Tremblay won both the mayoralty and a majority of seats in the new city council thanks to strong support from the former suburbs. The Union Montreal Party under Tremblay also won majorities in 2005 and 2009. Recently Montreal politics have been tumultuous. Gérald Tremblay resigned late in 2012 amid allegations of corruption and illegal fundraising by Union Montreal. These allegations came to light during the Charbonneau Commission’s inquiry into the awarding and management of public contracts in the construction industry, launched in May 2012. Michael Applebaum was appointed interim mayor after Tremblay’s resignation, but was arrested in June 2013 and charged with 14 criminal counts, including conspiracy, fraud, and breach of trust originating from when he was mayor of the Montreal borough Côte-des-Neiges-Notre-Dame-de-Grâce. Applebaum resigned shortly thereafter and was ultimately convicted of eight of the charges, serving two months in prison before being paroled in 2017. Laurent Blanchard, former city councillor for the Hochelaga district of Mercier-Hochelaga-Maisonneuve and chair of the city’s Executive Committee, was elected acting mayor in June 2013. That November, veteran Liberal member of Parliament	Denis Coderre was elected mayor, pledging a unifying, honest leadership that would work to restore the city’s reputation. Voters denied Coderre a second term, however, electing community organizer and city councillor Valérie Plante as Montreal’s first woman mayor in November 2017. Olympic Stadium, Montréal (photo by Thomas Kitchin). Outside stage of Festival international de jazz de Montréal, Canada's foremost jazz festival (courtesy Festival de jazz de Montréal). The Biodome in Montréal houses thousands of plants and animals representative of the ecosystems of the Americas (courtesy Canadian Tourism Commission). A strong francophone population gives Montreal a distinctive character among large North American cities. It is the main centre of expression and diffusion of French Canadian culture, as well as the meeting place between the French and American cultures. The anglophone minority also has its particular cultural institutions in the city. Montreal is an important university centre, with two French-speaking universities: Université de Montreal and Université du Quebec à Montreal, and two English-speaking universities: McGill and Concordia. Located in Montreal, the Quebec National Library has copies of all works published in the province. A new library building opened to the public in 2005 and is the home of the Bibliothèque et Archives nationales du Quebec (BAnQ), and serves as the central library for the island of Montreal. The Musée des Beaux-Arts, established in 1860, contains a general collection, while the Musée d’Art Contemporain collects the works of contemporary artists. Other museums include the McCord Museum, which specializes in the social history and material culture of Canada, Pointe-à-Callière, which showcases the archaeology and history of Montreal, and the world-class Canadian Centre for Architecture. With six concert halls, the Place des Arts is the main centre for performing arts. The new Maison symphonique de Montreal, opened in 2011, is home to the Orchestre symphonique de Montreal. The city also enjoys the Orchestre Métropolitain and the Opéra de Montreal, and Les Grands Ballet Canadiens and other dance companies are also based in the city. Many French-language theatre companies perform there, including Théâtre du Nouveau Monde, Théâtre du Rideau Vert, Théâtre de Quat'Sous, Espace Go and Théâtre Ubu. The city houses the world-renowned Cirque du Soleil and the École nationale du cirque. The Montreal Botanical Garden, founded 1931, is one of the world’s greatest botanical gardens, with a collection that now exceeds 22,000 different plant species. The Montreal Biodome houses thousands of plants and animals living in environments representative of four distinct ecosystems of the Americas. The Molson Centre is home to the Montreal Canadiens, the city's most famous professional sports team. They have won the Stanley Cup	more often than any other team and are one of sport's most enduring dynasties. The Montreal Expos called the city home for 35 years, but bad management, the 1994 Major League Baseball strike, and the refusal of the provincial government to pay for a new downtown stadium eventually led the team to leave Montreal in 2004. In 1996, nine years after being disbanded, the Montreal Alouettes	returned to the CFL and still play in Montreal. The city hosts the annual Canadian Grand Prix Formula One automobile race. Montreal is also a centre for international competitions in amateur sports, the most famous so far being the 1976 Summer Olympics. Montreal hosts many major seasonal attractions. In May, the Festival TransAmériques gives free outdoor performances, and June features the International Fireworks Competition, the world's largest pyrotechnical display. The Montreal International Jazz Festival	gets underway in early July with jazz musicians performing in halls around the city and in the streets. This is followed by the famous Just for Laughs Festival, and the French song and music festival Francofolies. The annual World Film Festival marks the end of the city’s summer festival season. MontréalSite officiel de la Ville de Montréal. MontréalThe official website for the City of Montréal. Click on "Activities and recreation" to access information about the many outstanding cultural and heritage sites within the city.